You could spend a lifetime traveling the country looking for the best Bloody Mary, or you could save this list and save yourself a bundle of time and money. 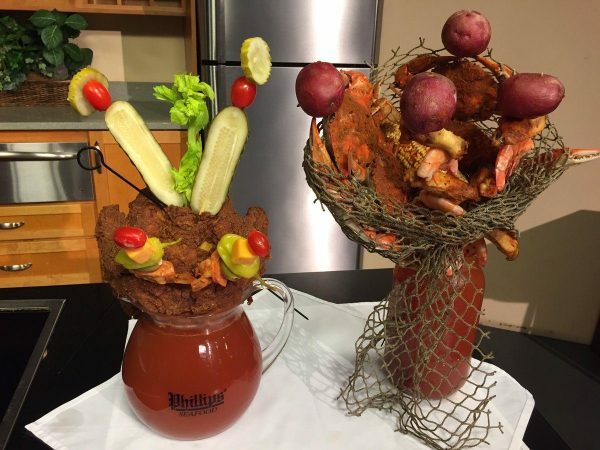 But hey, what you choose to do with your time is your own business – we’ll be in Baltimore enjoying one of the Bloody Mary Meals pictured above. Healthy types prefer to drink their lunch all the time. I know because I see them sucking on their straws in line at those juice stops. Well, I like to drink my lunch too, especially when it comes with beef jerky, cheese, shrimp, a craw fish, and a bacon and cheddar slider. 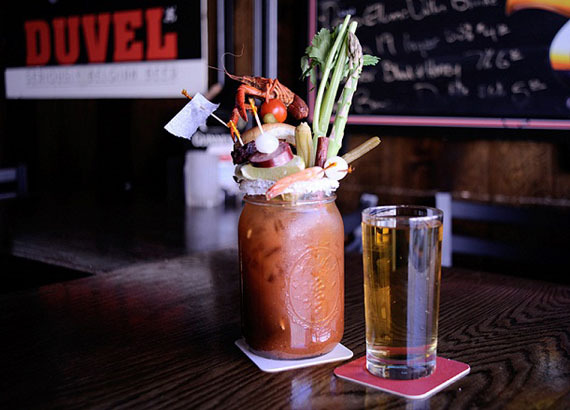 And for you healthy types, yes, the “F*ck Brunch” bloody mary at Anvil Pub is also garnished with Brussels sprouts, green beans, okra, onions, tomato, olives, asparagus, and a pickle. Texas does everything bigger and better. 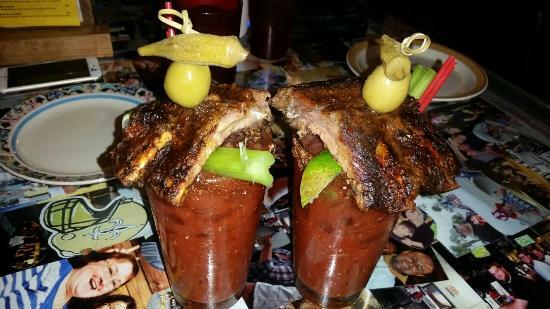 And the folks in Colorado can get pretty tired of hearing that saying, and so the Smak restaurant has upped the ante with their SMAK Bloody Mary. It includes TWO sliders skewered together (one beef, the other lamb) and is then garnished with all the classics, including a celery stick, bacon, black pepper, lime, lemon, onions, stuffed olives – plus a few pickled non-classics, like okra, green beans, and asparagus. 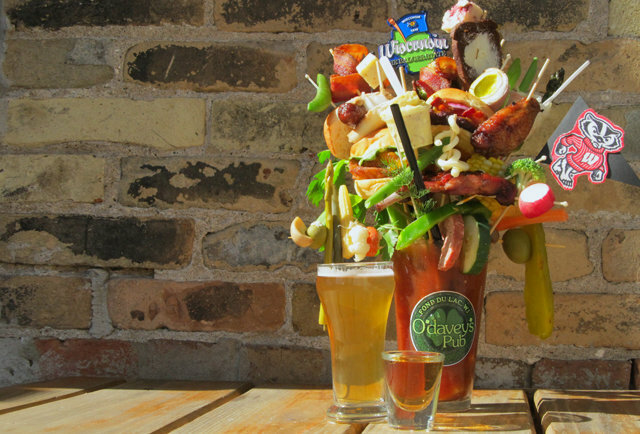 Wisconsin loves their cheese, meat, Brewers baseball team and bloody marys. And if you head down to O’Davey’s Pub on the first Sunday of every month, you can love all four at the same time with their amazing $5 Brewers Themed BM. It comes with dill cheese curds, cheese chunks (pepperjack and cranberry), salami, corn on the cob, prime rib, venison, a jalapeno popper, bison burger, fish sandwich, chicken wing, bread (buttered rye), potatoes, mushrooms, and we’re missing a few toppers – but my fingers are getting sore, and I think you get the point. Okay, let’s stop with the typical escalating male banter that states “bigger is most always better,” because us women know that isn’t always the case (wink wink). 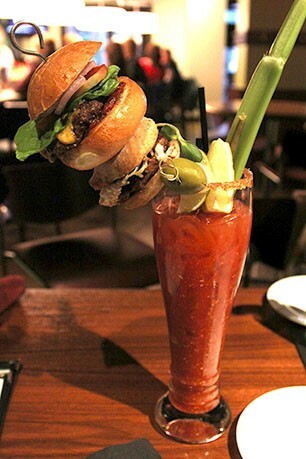 Take for instance, the BBQ Bloody at That Boy Good BBQ. And while you may think the star of this show must be the house smoked rib, assortment of pickled vegetables, and that artistic steeple of olive and okra. But you’d be wrong, as it is actually their jalapeno infused vodka that steals the show. Finally, some truth in advertising can be found at Phillips Seafood when you can order a “Bloody Mary Meal”. You get your choice of either their Crab Feast ($100), garnished with Hard shell crab, shrimp, chicken wings, corn on the cob and potatoes – or their Eastern Shore Chicken Combo ($75), topped with crab cake sliders, corn shrimp, and a whole fried chicken. And they have even more “Bloody Enhancements” for you to experiment with, but we’ll leave you pondering on those first two.